How cold environments are distributed throughout the world. The different periods of climate in a cold environment. The different factors that contribute to a cold environment. The relationship of latitude to climate. 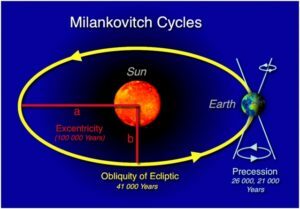 The Milankovitch Cycle and its characteristics. 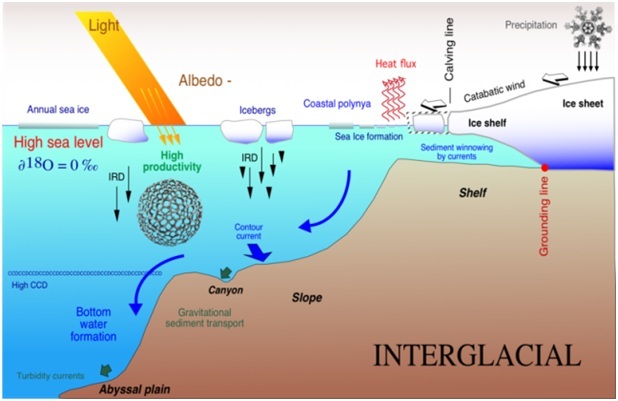 The allocation of cold environments is not fixed, meaning it undergoes changes from time to time as a result of the fact that our planet is undergoing a cycle of hot and cold phases, as it always has. For this reason, there is no possibility that the planet’s climate will remain the same forever. In the north, land mass content is zero, however, the sea is frozen. The frozen mass expands and shrinks depending on the current season. We also see nonstop permafrost in certain locations like Siberia and the northernmost portion of Canada. Glacial period – this is an extremely cold period wherein temperatures drop significantly in areas of lower latitude and altitudes. The last known glacial period began 30,000 years ago and achieved its coldest stage 18,000 years ago. It concluded 10,000 years ago, so we are not currently living in a glacial period. Interglacial period – this is a period when the temperature is higher than normal which results in a much warmer climate. In Britain, there are certain portions of Northern Scotland which experience cold environments for most of the year and there is a standard covering of snow in winter in Aviemore. To conclude, one factor that contributes to a cold environment of a specific area is latitude. There is a huge connection between the climate of a certain region and its latitude. The temperature in regions are generally warmer the nearer they are to the Equator, whereas they are colder when closer to the Poles. Sunlight is a big factor in heating the earth, and at higher latitudes, the rays of the sun hit the planet at a more slanted angle. At the equator, though, the sun’s rays collide at a straight angle and heat the land more thoroughly. However, there are other factors, like the height of a region, currents of the ocean, and snowfall, which also affect the behaviour of the climate. The movement of our planet in relation to the sun plays a role, too. 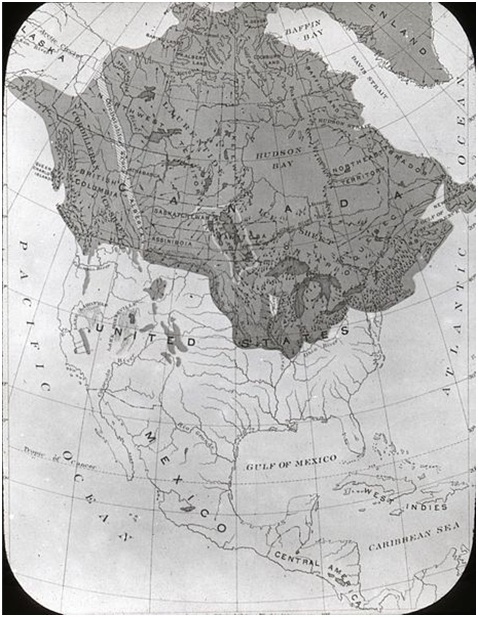 Humans also have a part in this distribution of cold environments. Man-caused climate change results in global warming that can significantly affect this distribution. By reducing climate change, we could prevent the alteration of the cold environments. By understanding this knowledge and taking care of our environment, we are doing a favor for ourselves and for our environment. Continentiality – the further inland you are in a continent, the more intense the temperatures you will experience. There are certain parts of the world where countries have the same latitude but do not have permafrost. This is because of continentiality. Altitude – typically far from higher latitudes, our planet has a large portion of cold environments that are located in the mountains, such as the Himalayas, the Alps, and the Andes. These portions of land are located in high altitudes, which is another determining factor in how cold a location is. Albedo – we previously discussed this in another module. Albedo measures the reflectiveness of a certain area in our planet. Elevated albedo levels mean a surface is more reflective. Maps use colors to represent the climate that is experienced in certain areas. Alteration in the quantity of carbon dioxide and methane in the sky. A high content of carbon dioxide results in a much warmer climate because it traps radiation in our atmosphere. The varying quantity of dust and particles in the sky after an eruption of a volcano. These heavy particles in the sky, like dust, cover up our atmosphere and can eventually result in an increase in temperature. 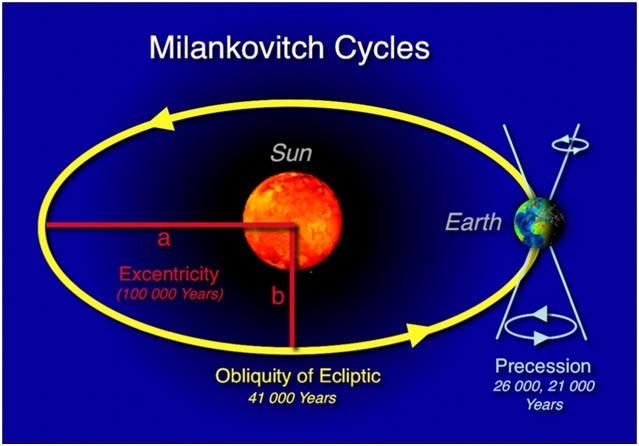 The Milankovitch cycles – changes in the inclination of our planet’s axis and orbital shape around the sun. Eccentricity: the orbital shape of our planet around the sun. It is continuously changing, and it is estimated that for one-tenth of a million years it differs from the elliptical percentage. Axial Tilt: the inclination of our planet’s axis with regards to the plane of its orbital plane around the sun. Changes in its degree follow a 41,000 year-cycle and fall in the range of 3 degrees. Precession: our planet’s gradual vibration as it is moves on its axis. These vibrations of the planet on its axis can be thought of like a spinning top that is winding down and vibrating back-and-forth. It has a period of 23,000 years before it changes its variation. Change of the land’s formation because of several factors like the melting of ice, either due to natural or artificial causes. We are seeing these changes caused by climate change because there is a continuous increase in temperatures across the various cold environments as a result of global warming. In conclusion, we have learned in this module that there are a lot of factors that determine the climate in particular regions. The primary factor for the distribution of cold environments is the location and the climate condition of nearby land. This is why we have varied cold environments throughout the world.